A C C I D E N T.
A rub. It’s all that separates a flawless round from “better luck next time.” But you’re not depending on luck. You’re depending on countless hours in and out of the saddle. And you didn’t come here for just a ribbon. You came for the championship ribbon. So ask yourself, does your horse have the stomach to win? When administered for 8 or 28 days, just one dose a day of ULCERGARD is proven to effectively prevent performance-robbing equine stomach ulcers in horses exposed to stressful conditions. IMPORTANT SAFETY INFORMATION: ULCERGARD can be used in horses that weigh at least 600 pounds. Safety in pregnant mares has not been determined. You donâ&#x20AC;&#x2122;t see the whole picture when a horse steps into the show ring. A horseâ&#x20AC;&#x2122;s success starts on the inside. KindredBio has a strong pipeline with novel drugs and biologics in development that are made to meet the needs of the horse, the owner, the trainer, and the veterinarian. Animals speak louder than words. If there’s greatness on the inside, it shows on the outside. All Grand Prix held at this circuit are eligible for inclusion on the USEF Rolex/Show Jumping Ranking List. 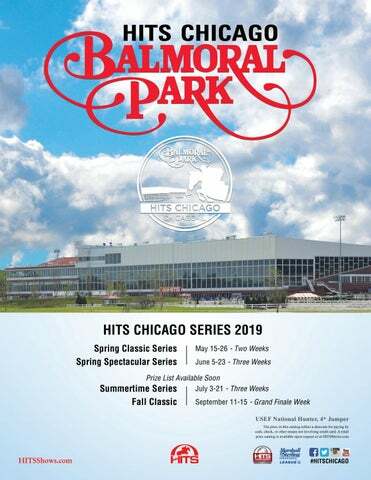 Showplace Spring Classic | I,II | 19053, 19054 Showplace Spring Spectacular | I,II,III | 19055, 19056, 19057 Telephone communication with HITS Inc. - 845.246.8833 All entries should be mailed to: HITS Inc., 319 Main Street, Saugerties, NY 12477 Telephone communication during HITS Chicago - 708.304.2329 Horse Show mailing address: 26435 South Dixie Highway, Crete, IL 60417 The Competition Management for these events is HITS, Inc.
Amazing Results by Itself! Use with Back on Track Products for an Extra Kick! Mesh Sheets & Quick Wraps now available Use Limber Up daily as part of in Black, Navy, Burgundy and Hunter Green your grooming regime! Riding isn’t just a sport; it’s your passion and way of life. Whether you’re at home, in the barn or on the road, AIG knows what it takes to protect your successful, active lifestyle. Our custom-tailored personal and equine insurance solutions help safeguard all you hold dear. Equine Liability / Homeowners / Automobile / Private Collections For more information on our equine solutions, please visit www.aigprivateclient.com/equine or call 888 594 7061. AIG Private Client Group is a division of the member companies of American International Group, Inc. (AIG). Insurance and services provided by member companies of AIG. Coverage may not be available in all jurisdictions and is subject to actual policy language. For additional information, please visit our website at www.aig.com. Open to horses and ponies. Low Hunter - Open to horses and ponies. Open to all horses. Ponies are NOT eligible. The last class # is Under Saddle unless noted. Underlined class is a M&S League qualifier. A Baby Green is a horse of any age in its first year of showing. The last class # is Under Saddle. Underlined class # is Handy. Green Hunter 3'	Green Hunter 3'3"
Open to Horses five years of age or younger. Open to Horses six years of age or younger. Open to Horses seven years of age or younger. See details in this book for the Stal Hendrix Green Hunter 3’ & 3’3” Futurity Final to be held at the HITS Championship. The last class # is Under Saddle. Small Junior Hunter	Large Junior Hunter	Small Junior Hunter 3'3"	Large Junior Hunter 3'3"
The first class # is Conformation. The last class # is Under Saddle. Underlined class # is Handy. Yearlings	695	2-Year Olds	696	3-Year Olds	697	Best Young Horse	698	Open to 1st place and 2nd place horse in Yearlings, 2-Year olds & 3-Year olds. Horse/Rider or Pony/Rider combination MAY NOT cross enter into any “C” or “A” rated hunter divisions. Horse/Rider combination MAY cross enter into the “A” Rated Hunter sections. Open to Junior Riders under 11 years of age who are not showing in a rated hunter section. Open to Riders (horses) 12 years of age or older who are not showing in a rated Hunter section. Open to Junior Riders on Ponies. May compete at any fence height regardless of pony size. May only compete once. Open to Junior Riders who have not won a blue ribbon in Hunter Seat Equitation at a recognized USEF or EC show. Open to Junior Riders who have not won three blue ribbons in Hunter Seat Equitation at a recognized USEF or EC show. Open to Junior Riders who have not won six blue ribbons in Hunter Seat Equitation at a recognized USEF or EC show. Open to Junior Riders who have not won twelve blue ribbons in Hunter Seat Equitation at a recognized USEF or EC show. Open to Junior Riders. Mini Medal, Mini Maclay, Mini HITS. Open to Adult Amateur Riders who are not showing in a rated section. Open to Adult Amateur Riders who are not showing in a rated section. Open to Adult Amateur Riders who are not showing in a rated section. Open to Junior Riders 11 years of age or younger who are not showing in a rated s­ ection. 360 - Walk / Trot. 361 - Walk / Trot / Canter. Open to Riders 12 years of age or older who are not showing in a rated s­ ection. Open to Junior Riders 11 years of age and younger who are not showing in a rated s­ ection. No Oxers. Open to Riders 12 years of age or older who are not showing in a rated s­ ection. No Oxers. Beginner Equitation Eq,U/S,Pleasure	655,656,657	Open to Junior Riders 11 years of age and younger who are not showing in a rated s­ ection. To be shown at a walk and trot (not to canter) both directions of the ring. Advanced Beginner Equitation Eq,U/S,Pleasure	658,659,660	Open to Junior Riders 13 years of age and younger who are not showing in a rated s­ ection. To be shown at a walk, trot and canter both directions of the ring. Leadline Equitation Walk,Walk,Walk/Trot	661,662,663	Open to Junior Riders 9 years of age and younger who are not showing in a rated s­ ection. To be shown at a walk, or walk trot, both directions of the ring. Leadline optional. Rider may not cross enter into any other class with Fence Heights higher than 3’. Children’s/Adult Jumper Low	Children’s/Adult Jumper High	1.20m FarmVet Jumper	1.30m Jumper	1.35m Jumper	Junior/A-O/Am CWD Jumper - 1.20m	Junior/A-O/Am CWD Jumper - 1.30m	Junior/A-O/Am CWD Jumper - 1.40m*	*Jr/A-O/Am 1.40m held only if 8 or more entries. Two-round classic. Fences 2’6”. Riders must be Juniors or Amateurs. Horse or pony must have entered, shown and completed the course in two classes over fences at the show. No cross entry of rider into any Rated Hunters, or any class with fences 3’ or higher. Designated first-round classic. Horse must have entered, shown and completed the course in two Junior Hunter classes over fences at the same show. Designated first-round classic. Horse must have entered, shown and completed the course in two A-O Hunter classes over fences at the same show. Designated first-round classic. Ponies must have entered, shown and completed the course in two Pony Hunter classes over fences at the show. Designated first-round classic. Horse or pony must have entered and shown in two Children’s or Adult Hunter classes over fences at the show. Designated first-round classic. Horse or pony must have entered and shown in two Adult Hunter classes over fences at the show. Each age group will be able to jump their Classic Round at the end of their respective division on Sunday. Designated first-round classic. Fences 18”. Riders must be Juniors or Amateurs. Horse or pony must have entered, shown and completed the course in two classes over fences at the show. See current IHJA specs. Classes will be combined if fewer than six entries in each. Designated first-round classic. Fences 2’6”. Riders must be Juniors or Amateurs. Horse or pony must have entered, shown and completed the course in two classes over fences at the show. See current IHJA specs. One-Round Classic. Fences 2’. Open to Junior and Amateur riders who are not showing in a rated section. Horse must have entered in two classes over fences at the show. Two-round classic. Fences 3’5”. Open to horses ridden by Jrs, Amateurs or Professionals. Riders are not limited to the number of horses they may ride. Qualifier for the Diamond Mills Hunter Prix Final. To be held as an overlay with classes 68 & 73, Green Hunter 3’ and 3’3”. See Details on Following Pages. Designated first-round Classic. Fences 3’ and 3’3”. See Details on Following Pages. Table II.2.b. .90m, 2’11”. The horse must have shown in at least one other Modified Children’s/Adult Jumper Class at the same show. See current IHJA specs. Table II.2.b. .80m, 2’7”. Open to Junior and Amateur Riders. The horse must have shown in at least one other Jumper Class at the same show. No Cross entry of Rider into any class with fences higher than .95m, 3’ at the same show. Table II.2.b. 1.0m, 3’3”. The horse must have shown in at least one other Children’s or Adult Jumper Low Class at the same show. See current IHJA specs. This horse must have shown in one other Children or Adult Jumper Class at the show. Table II.2.b. 1.25m, 4’1”. The horse must have entered in at least one other Junior or A-O/Amateur Jumper class at the same show. Table II.2.a/b. 1.35m, 4’5”. The horse must have entered in at least one other Junior or A-O/Amateur Jumper class at the same show. No cross entry of horse or rider into the Child or Adult Jumper Classic at the same show. Table II.2.a/b. 1.40m, 4’7”. The horse must have entered in at least one other Junior or A-O/Amateur Jumper class at the same show. No cross entry of horse or rider into the Child or Adult Jumper Classic at the same show. Jr/A-O/Am 1.40m Classic will be held if at least 8 entries. Qualifier for the Black Barn $250,000 Jr/A-O/Am Jumper Prix. Table II.2.b. 1.40m, 4’7”. Open to Nominated Jumpers. Table II.2.b. 1.40m, 4’7”. Open to Nominated Jumpers. Table II.2.b. 1.30m, 4’3”. Open to Nominated Jumpers. Table II.2.a. Time first Jump-off. National Standard. 401. $1,000 AIG JR HUNTER CLASSIC - 3'3" & 3'6"
402. $1,000 A-O HUNTER CLASSIC - 3'3" & 3'6"
Two-round classic. Fences 2’6”. Riders must be Juniors or Amateurs. Horse or pony must have entered, shown and completed the course in two classes over fences at the show. No cross entry of rider into any Rated Hunters, or any class with fences 3' or higher. Designated first-round classic. Horse or pony must have entered and shown in two Children's or Adult Hunter classes over fences at the show. Two-round classic. Fences 3'5". Open to horses ridden by Jrs, Amateurs or Professionals. Riders are not limited to the number of horses they may ride. Qualifier for the Diamond Mills Hunter Prix Final. To be held as an overlay with classes 68 & 73, Green Hunter 3' and 3'3". See Details on Following Pages. Designated first-round Classic. Fences 3' and 3'3". See Details on Following Pages. Table II.2.b. 1.0m, 3'3". The horse must have shown in at least one other Children’s or Adult Jumper Low Class at the same show. See current IHJA specs. Table II.2.b. 1.25m, 4'1". The horse must have entered in at least one other Junior or A-O/Amateur Jumper class at the same show. Table II.2.a/b. 1.35m, 4'5". The horse must have entered in at least one other Junior or A-O/Amateur Jumper class at the same show. No cross entry of horse or rider into the Child or Adult Jumper Classic at the same show. Table II.2.a/b. 1.40m, 4'7". The horse must have entered in at least one other Junior or A-O/Amateur Jumper class at the same show. No cross entry of horse or rider into the Child or Adult Jumper Classic at the same show. Jr/A-O/Am 1.40m Classic will be held if at least 8 entries. Qualifier for the Black Barn $250,000 Jr/A-O/Am Jumper Prix. 416. $10,000 JOHNSON HORSE TRANSPORTATION OPEN WELCOME	Wednesday	Table II.2.b. 1.40m, 4’7”. Open to Nominated Jumpers. Table II.2.b. 1.40m, 4'7". Open to Nominated Jumpers. Table II.2.b. 1.30m, 4'3". Open to Nominated Jumpers. DERBY JUBILEE - See following pages for details on Derby Jubilee, at Spring Spectacular III, featuring a $25,000 USHJA International Hunter Derby, $10,000 USHJA National Hunter Derby and $2,500 USHJA Pony Derby. Two-Round Classic. Fences 3’6”-3’9” with 4’ options. Open to all. See detailed specs on following pages. Two-Round Classic. Fences 3’ 3’5” options. Open to all. See detailed specs on following pages. Two-Round Classic. Fences 2’3”, 2’6”, 3”. Top 50 ranked riders will be qualified for finals. This is the place to show all NCAA College coaches why they should recruit you! USHJA INTERNATIONAL HUNTER DERBY 600. USHJA INTERNATIONAL HUNTER DERBY ELIGIBILITY - Open to all. Riders are limited to four (4) horses in this class. Horses are not required to show in any other class at the competition, but may compete in any class for which they are otherwise eligible. Owners, Riders and Trainers must be current Active Competing Members of USEF and USHJA. Horses must have USEF Recording and USHJA Registration. Change of rider after the First Round is not permissible. CONDITIONS AND SPECIFICATIONS - Fences 3’6”-4’, with at least four (4) option fences 4’3” or higher per round. To be judged under the Open Numerical scoring system by two panels of two judges each. One Panel will be designated the tie-breaking panel for Round 1; this panel will also be the tie-breaking panel for the jump-off, if any. The other Panel will be the tie-breaking panel for Round 2. To be scored on quality, movement, jumping style, manners and way of going. Pace and brilliance are to be rewarded. Jumping decorations to utilize a shorter track is not permissible in any round. Round 1: To be shown over a Hunter Classic course of at least 10 fences. In addition to the base score, each judging panel must award an Option Bonus Score consisting of one additional point for every higher height option fence jumped. Scores will be added to determine the total score for the round. The top 12 will return in reverse of scores for the Second Round. In the case of ties, the Base score of the tie-breaking panel will be used to break the tie. Round 2: To be shown over a Handy Hunter course of at least 10 fences. In addition to the base score, each judging panel must award an Option Bonus Score consisting of one additional point for every higher height option fence jumped and a Handy Bonus Score between zero and 10 bonus points. Scores will be added to determine the total score for the round. In the case of ties, the Base score of the tie-breaking panel will be used to break the tie. Scores from Round 1 and Round 2 will be added to determine the overall winners. In the case of a tie for First Place, a Jump-off will be held. In the case of ties for all other places, the Base score of the Round 2 tie-breaking panel will be used to break the tie. Round 3: In the case of an overall tie for First Place, a Jump-off will be held. To be shown over a course of at least 8 fences. Scoring to be the same as for the Handy Hunter Round. Jump-off score to be added to the total score from Round 1 and Round 2 to determine the winners. POINTS AND AWARDS - In order to earn USEF Horse of the Year points, exhibitors must declare in which section points are to count by submitting a completed USHJA Declaration Form to the Show Office by the end of the competition. Only Juniors and Amateurs may declare for the applicable Junior or Amateur-Owner section. In order to earn points toward IHD Awards and Finals, Horses must be enrolled in the International Hunter Derby program. Enrollment is not required to compete in the class. SECURE STABLING - Horses must purchase a stall and be stabled on the grounds 24 hours prior to the start of the class. Horses must remain on the competition grounds until finished competing in the Derby. Any horse in violation of this requirement will be disqualified. HORSE INSPECTION - Horses must jog for soundness during the Official Jog the day before the class. Time and location to be announced. Horses must be officially entered in the Derby prior to the jog. If a horse does not pass the jog, there will be one opportunity for the horse to be re-presented at a time to be determined, up to one hour prior to the start of the class. SCHOOLING REQUIREMENTS - During the 24 hour period prior to the class, horses must be ridden in official horse show schooling areas only. Competition number must be worn at all times while mounted. ORDER OF GO - The Order of Go for the First Round will be drawn. The Order for the Second Round will be reverse order of scores from Round 1. The Order for the Jump-off, if any, will be the same as that for Round 2. ATTIRE - Formal attire required. Buff breeches and shad belly, white breeches and dark or scarlet coat, hunt colors coat or official sponsor or team jacket permitted. RIBBONS AND AWARDS - Ribbons 1-12 for First Round, Second Round and Overall. For Complete Rules and Specifications visit USHJA.org. Everyday training and competing takes its toll. Before joint issues sideline your dreams, attack them with LEGEND. It delivers effective therapy whether delivered into the vein (IV) or the joint (IA).1 Talk to your veterinarian and be an equine LEGEND. LEGEND product label and FOI summary. IMPORTANT SAFETY INFORMATION: The safety of LEGEND has not been evaluated in breeding stallions or in breeding, pregnant or lactating mares. The following adverse reactions have been reported following use of LEGEND Injectable Solution: Following intravenous use: occasional depression, lethargy, and fever. Following intra-articular (LEGEND Injectable Solution — 2 mL only) use: lameness, joint effusion, joint or injection site swelling, and joint pain. 4 mL For Intravenous Use In Horses Only 2 mL For Intravenous or Intra-Articular Use In Horses Only BRIEF SUMMARY Prior to use please consult the product insert, a summary of which follows: CAUTION Federal Law restricts this drug to use by or on the order of a licensed veterinarian. INDICATIONS LEGEND® Injectable Solution and LEGEND® Multi Dose Injectable Solution are indicated in the treatment of equine joint dysfunction associated with equine osteoarthritis. CONTRAINDICATIONS There are no known contraindications for the use of LEGEND® Injectable Solution and LEGEND® Multi Dose Injectable Solution in horses. RESIDUE WARNINGS Do not use in horses intended for human consumption. HUMAN WARNINGS Not for use in humans. Keep out of reach of children. ANIMAL SAFETY WARNING For LEGEND Injectable Solution 4 mL and LEGEND Multi Dose Injectable Solution – Not for Intra-articular use. The Intra-articular safety of hyaluronate sodium with benzyl alcohol has not been evaluated. PRECAUTIONS Complete lameness evaluation should be conducted by a veterinarian. Sterile procedure during the injection process must be followed. Intra-articular injections should not be made through skin that is inflamed, infected or has had a topical product applied. The safety of LEGEND Injectable Solution and LEGEND Multi Dose has not been evaluated in breeding stallions or in breeding, pregnant or lactating mares. ADVERSE REACTIONS No side effects were observed in LEGEND Injectable Solution clinical field trials. Side effects reported post-approval: Following intravenous use: Occasional depression, lethargy, and fever. Following intraarticular (LEGEND Injectable Solution – 2 mL only) use: joint or injection site swelling and joint pain. For medical emergencies or to report adverse reactions, call 1-800-422-9874. ANIMAL SAFETY SUMMARY Animal safety studies utilizing LEGEND Multi Dose Injectable Solution were not performed. LEGEND Multi Dose Injectable Solution was approved based on the conclusion that the safety of LEGEND Multi Dose Injectable Solution will not differ from that demonstrated for the original formulation of LEGEND Injectable Solution. LEGEND Injectable Solution was administered to normal horses at one, three and five times the recommended intra-articular dosage of 20 mg and the intravenous dose of 40 mg. Treatments were given weekly for nine consecutive weeks. No adverse clinical or clinical pathologic signs were observed. Injection site swelling of the joint capsule was similar to that seen in the saline treated control horses. No gross or histological lesions were observed in areas of the treated joint. For customer care or to obtain product information, including a Material Safety Data Sheet, call 1-888-637-4251 Option 2. ®LEGEND is a registered trademark, and ™ the Horse Logo is a trademark, of Merial. ©2016 Merial, Inc., Duluth, GA. All rights reserved. USHJA HUNTER PROGRAM SPECIFICATIONS USHJA NATIONAL HUNTER DERBY Separate Two-Round Classic. Open to horses and ponies ridden by Professional, Junior or Amateur riders. There is no limit to the number of horses a rider may ride. Fences 3’-3’3’ in Height, with four “option” fences in round set at 3’5”. To be shown over a Hunter Classic type course with a minimum of 10 fences at thee required height. To be judged on performance, hunter pace, jumping style, quality, and substance and movement under the Open Numerical scoring system. One Bonus Point will be added to base score for each higher “option” fence jumped. The Top 12 will return for the Handy round over a course of 8-10 fences. To be judged on style, brilliance and handiness. Handiness will be rewarded in the base score. One Bonus Point will be added to base score for each higher “option” fence jumped. Scores will be added to determine the winners. Trophy, Ribbons and Prize Money 1-12. USHJA GREEN HUNTER CHALLENGE Designated First Round Classic. Open to horses of any age that are eligible Green horses in their first or second year of competing over fences set at 3’ or 3’3”. To be ridden by professional, junior, or amateur riders. There is no limit to the number of horses a rider may ride. The horse may compete in both the Green Incentive Stake and the Green Hunter Challenge at the same show. Fences 3’ & 3’3”. To be held over a course of at least eight fences the required height. To be judged on quality, movement, jumping style, manners and way of going using the open numerical scoring system. The Top 12 will return for a Second Round over a course of 8-10 fences. Scores will be added to determine the winners. Horses must be enrolled in the Green Incentive Program and pay the annual enrollment fee prior to competing in the Green Incentive Stake class. It is the exhibitor’s responsibility to ensure the horse is properly enrolled. A horse that competes is the Stake class but is not properly enrolled will forfeit all prize money, awards and entry fee for the class. See Class Schedule for Designated First round class. Trophy, Ribbons and Prize Money 1-12. USHJA GREEN HUNTER INCENTIVE STAKE Open to horses of any age that are eligible Green horses in their first or second year of competing over fences set at 3’ or 3’3”. To be ridden by professional, junior, or amateur riders. There is no limit to the number of horses a rider may ride. The horse may compete in both the Green Incentive Stake and the Green Hunter Challenge at the same show. Fences 3’ & 3’3”. To be held concurrently with the last class of the Green Hunter 3’ and 3’3” divisions, over a course of at least eight fences the required height. To be judged on quality, movement, jumping style, manners and way of going using the open numerical scoring system. Horses must be enrolled in the Green Incentive Program and pay the annual enrollment fee prior to competing in the Green Incentive Stake class. It is the exhibitor’s responsibility to ensure the horse is properly enrolled. A horse that competes is the Stake class but is not properly enrolled will forfeit all prize money, awards and entry fee for the class. This class must be entered separately from the Green Hunter division to be considered for awards. Trophy, Ribbons and Prize Money 1-12. Complete Specifications on these classes available at ushja.org. Restore synovial joint lubrication Repair joint cartilage Reverse the disease cycle Reduce inflammation Adequan® i.m. actually treats degenerative joint disease, and not just the signs. Ask your veterinarian if Adequan® i.m. is the right choice for your horse. Learn more at adequan.com. e c n e d fi n venient. o n o C C . e f a S Proven. Three formulations to fit your needs in and out of competition: Injection, Paste and Tablet. We’re Smartphone friendly! Take us with you. We’ll take you where YOU need to go! Flight. When heâ&#x20AC;&#x2122;s prepared, the possibilities are limitless. THE NEW D-TEQ. How Great Gets Better. The boot that offers the most effective protection today, just got better. Pushing the limits of what’s possible. D-Teq™ Boots. + Reinforced StetchTeq™ straps Find that perfect fit for sizes big and small. Never too tight. Never too loose. Always just right. + The new Fetlock Relief Zone More room. More comfort. Enter an enhanced design with added fetlock relief. + ImpacTeq™ Replacement Liner now available in SheepsWool™ SheepsWool is hypoallergenic, naturally water-resistant and helps to fight odor. Office Fee of $50 & Horse Watch Fee of $15 per horse will be billed at the show. Storage Room	$250	x _______ Trainers: For every 10 stalls booked by Closing Date. One storage room is FREE! TRAINERS – Need to order Tack Stalls, Paddocks, RVs, feed/shavings, or do splits? See “Trainer’s Barn Account” under Entry Procedures in Rules and Regs for “how to”. claims made by others for any Harm caused by me or my horse while on the showgrounds prior to, during or after the Competition. I have read the Federation Rules about protective equipment, including GR801 and if applicable, EV114, and I understand that I am entitled to wear protective equipment without penalty, and I acknowledge that the Federation strongly encourages me to do so while WARNING that no protective equipment can guard against all injuries. If I am a parent or guardian of a junior exhibitor, I consent to the child’s participation and AGREE to all of the above provisions and AGREE to assume all of the obligations of this Release on the child’s behalf. I represent that I have the requisite training, coaching and abilities to safely compete in this competition. I AGREE that if I am injured on the showgrounds prior to, during or after competition, the medical personnel treating my injuries may provide information on my injury and treatment to the Federation on the official USEF accident/injury report form. BY SIGNING BELOW, I AGREE to be bound by all applicable Federation Rules and all terms and provisions of this entry blank and all terms and provisions of this prize list. If I am signing and submitting this Agreement electronically, I acknowledge that my electronic signature shall have the same validity, force and effect as if I affixed my signature by my own hand. Federation Release, Assumption of Risk, Waiver and Indemnification This document waives important legal rights. Read it carefully before signing. I have read the USEF Entry Agreement (GR 906.4) as printed in the Prize List for this Competition and agree to all of its provisions. I understand and agree that by entering this Competition, I am subject to Federation Rules, the Prize List, and local rules of the competition. I agree to waive the right to the use of my photos at the ­competition, and agree that any actions against the Federation must be brought in New York State. T H E O N LY S U P P L E M E N T S CLINICALLY PROVEN TO REDUCE HOCK LAMENESS. $________ Office Fee of $50 & Horse Watch Fee of $15 per horse will be billed at the show. BILLING INFORMATION - PLEASE READ CAREFULLY 1. IF BILLED TO TRAINER: Enter Trainer’s Name (DO NOT Use Farm Name) TRAINERS PLEASE NOTE: You may split your charges for feed and bedding among your customers after arrival. This must be done in the show office by Friday of each horse show week. You should advise your customers that these charges will be on their horse show bill and that they should not check out until after you have split your charges. Only the total dollar amount will be split, i.e., we will not split specific quantities of shavings or hay to each customer. However, you may charge different dollar amounts to your customers to account for individual usage. 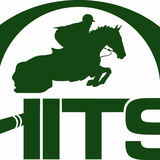 YOU MAY SEND THIS FORM WITH YOUR ENTRIES OR FAX AT A LATER DATE During the Horse Shows please fax to 708.304.2493 You may also place your order online at HITSShows.com. Aon can help you empower results To learn more, contact Joe Norick at 561-346-9000. S U N D AY 8 am 320. Adult Equitation Flat 322. Adult Equitation 114. Adult Hunter 36/O U/S 112. *	Adult Hunter 36/O 113.~	Adult Hunter 36/O 109. Adult Hunter 18-35 U/S 107. *	Adult Hunter 18-35 108.~	Adult Hunter 18-35 505	$500 NAL ADULT HTR CLASSIC (2nd Rnd) 605. $500 WIHS ADULT HTR CLASSIC (2nd Rnd) 392. ARIAT NATIONAL ADULT MEDAL 374. USEF ADULT MEDAL 770. Modified Amateur Hunter 97. A-O Hunter 18-35 3'3" 98.^	A-O Hunter 18-35 3'3" 102. A-O Hunter 36/O 3'3" 103.^	A-O Hunter 36/O 3'3"
Continued from Htr 2 25,26. Baby Green Hunter 29. Baby Green Hunter U/S 24. Training Hunter U/S 14. Schooling Hunter U/S 525,526. TAKE2 TB Htr 529. TAKE2 TB HtrU/S 530. Young Hunter 3' 531. Young Hunter 3' 535. Young Hunter 3'3"
Continued from Htr 2 22,23. Training Hunter 27,28. Baby Green Hunter 527,528. TAKE2 TB Htr 534. Young Hunter 3' U/S 532,533. Young Hunter 3' 539. Young Hunter 3'3" U/S 537,538. Young Hunter 3'3" 544. Young Hunter 3'6" U/S 542,543. Young Hunter 3'6"
Continued from Htr 2 536. Young Hunter 3'3" 540. Young Hunter 3'6" 541. Young Hunter 3'6"
Our group booking tools make it easy to get together with friends and family. COMFORTS OF Home on the go. Stay with us and we'll make you feel right at home with: • 73 Guest Rooms and Suites • Beekman 1802 White Water Collection Bath Amenity Line • Free Be Our Guest Breakfast • Pet Friendly • Free Freshly Baked Cookies • And more! ©2017 Country Inns & Suites By Carlson, Inc. All Rights Reserved. Conveniently located off of I-57, and closet hotel from Balmoral Park. Every Room has: ~ Microwave ~ Hair dryer ~ Refrigerator ~ Coffee Maker ~ Iron & Iron boards. You will also find dining place at close distance. We welcome HITS competitors and fans. Simply mention code “Hits Show” when booking, and receive a special rate. CHOICE HOTELS INTERNATIONAL 5815 W MONEE MANHATTAN RD, MONEE IL 60449 HOTEL PH: 708 534 3500 / CELL 706 936 0649 EMAIL: MONEEHOTELS@GMAIL.COM NON-SMOKING 2 QUEEN, NON-SMOKING KING, ROOM AVAILABLE:NON-SMOKING BUSINESS SUITE, NON-SMOKING JACUZZI FREE HOT BREAKFAST, FREE PARKING, INDOOR POOL, AMENITIES:- FREE WI-FI, VENDING SNACKS/POP, GUEST LAUNDRY 24 HOURS FRONT DESK SERVICE. FREE CONTINENTAL BREAKFAST, FREE PARKING, FREE WI-FI, VENDING SNACKS/POP, GUEST LAUNDRY 24 HOURS FRONT DESK SERVICE. Via a signed statement from the attending veterinarian that the horse has been vaccinated against the following: Within 6 months (180 days) of each show: Equine Influenza Within 6 months (180 days) of each show: EHV 1 and EHV 4 If a vaccination will expire during one of the shows, the horse must receive its new vaccination prior to being issued a competition number for that show. PRESENTATION OF HEALTH REQUIREMENTS The Equine Health Requirements are Required for all horses entering the Show Grounds both Showing and Non-Showing. These documents must be filed in the Show Office before any competition numbers will be issued. In addition, random checks for Equine Health Requirements will occur. Be sure to keep a copy of all of your horse’s Equine Health Requirements in an easily accessible spot (in your tack room or tack trunk, truck or trailer) to ensure you can comply with this requirement. The results on all required papers must indicate the horse’s registered (show) name. Any horse not accompanied by these documents will be directed to the Show Veterinarian to obtain the required documents and/ or vaccinations, and/or will be placed in quarantined stabling until the proper documents are obtained. Any horse showing signs of fever/illness/stress is subject to examination by HITS Officials and/or the Show Veterinarian, who may at their sole discretion, place the horse in quarantined stabling or take further action if deemed necessary. See Rules and Regs for more information, and visit HitsShows.com for the most up to date requirements. DIRECTIONS TO HITS BALMORAL PARK FROM THE NORTH: Take I-94 Express and I-94 E to IL-394 S toward Danville. Turn right on South Dixie Highway (IL-1). HITS Balmoral Park will be ¾ mile down on your right. FROM THE SOUTH: Take IL-1 N towards Chicago. Bear left on IL-1 N/S. Dixie Highway. HITS Balmoral Park will be ¾ mile down on your right. Complete an enrollment form for each horse online. Place a qualifying auto-ship order in Platinum Paks® or Buckets. Continue with annual recommended veterinary wellness requirements. Look for this new icon designating Platinum Colic Coverage™ -qualified formulas! | angmasucci | Lauren W.
WHAT WILL YOUR REASON BE? Search #WhyIColiCare on Facebook, Twitter, and Instagram to read why other horse owners have chosen to enroll their horses in ColiCare, SmartPak’s free $7,500 colic surgery reimbursement program. Visit SmartPak.com/ColiCare to get started today, then share your story! CONDITIONS & SPECIFICATIONS GENERAL Poling: Poling WILL NOT be permitted on the grounds of HITS Chicago from Wednesday through Sunday of each show week. Marshall & Sterling Insurance League Membership: League membership is required for points to count for classics and classes that are affiliated with the Marshall & Sterling Insurance League. Websites: For additional Rules, Regulations and Specifications, visit these websites: HITS: HITSShows.com	M&S Insurance League:	HITSShows.com/M-S-Insurance-League	IHJA:	IHJA.com USEF: USEF.org	USHJA:	USHJA.org	OHJA: OHJA.org INHJA:	INHJA.com	OPHA:	OPHA.org	KHJA:	KHJA.org MHSA: MissouriHorseShowsAssociation.org	WHJA:	WHJA.org Awards: Ribbons will be awarded to eighth place in all Hunter and Jumper classes unless otherwise noted. International Riders: All classes held during the 2019 HITS Chicago Circuit will be held under National rules with regard to riders. If the capacity of International Riders exceeds the National riders rule, riders will be accepted on a first-come, first-served basis. HUNTERS Jog: The following sections will not jog: Hi-Low, Low, Schooling, HITS Hunter, Baby Green, Training, Young, Adequan, Thoroughbred, Adult, Children’s, Modified Children’s, Modified Adult, Pre-Children’s, Pre-Adult, Balmoral Children’s, Balmoral Adult, Short Stirrup, Schooling Pony, Modified Amateur and Modified Junior. Warm-Up: Ticketed warm-up schedule will be posted in the Horse Show Office. Tickets are $30 each and available in the Show Office. A book of 10 tickets may be purchased for $250. Schooling is prohibited in the show rings. 2019 Zone 5 Specifications: (Check USHJA.org for the most updated specs.) • Adult Amateur Hunter: To be shown by Adult Amateur Riders. Ponies may be shown by Adults, suitability to count. Riders may not compete in any other classes at the same competition where fences exceed 3’5” except equitation, jumper classes 1.20m and lower, Amateur-Owner Hunter and Jumper classes and the USHJA International Hunter Derby. Riders competing in the Amateur-Owner Hunter or Jumper sections may compete on one different horse in the Adult Amateur Hunter section. Horses can not cross enter into 3’3 or 3’6 Amateur-Owner sections at the same competition. Fences not to exceed 3’; spreads not to exceed fence height. • Children’s Hunter: To be shown by a Junior Rider. Riders may not cross enter into any class where the fences exceed 3’5 except equitation classes up to 3’9, jumper classes 1.20m and lower, Pony Jumpers, Junior Hunter sections and the USHJA International Hunter Derby. Riders competing in both the Children’s Hunter and Junior Hunter may only ride one horse in each division. Riders competing in the Children’s Hunter Pony may only ride one different horse/pony in the Green or Regular Pony Hunter section and Children’s Hunter Horse section. Horses entered in the Children’s Hunter Horse classes may not cross enter into Junior Hunter sections. Fence heights to be 3’ for horses; 2’6” for large ponies; 2’ for small and medium ponies; spreads not to exceed fence height. JUMPERS Jumper Nomination Fee: $175 Nominated Jumper Sections: 1.20m - 1.40m, Open, Grand Prix, Amateur, Amateur-Owner, and Junior Jumper. Non-Nominated Jumper Sections: .65m - 1.15m, Adult, Children’s, Modified Child/Adult, Pony Jumpers, and Young Jumpers. Eligibility: Any horse, regardless of winnings, is eligible to enter any .65m - 1.45m and Open Jumper Class. Declarations: Nominated Jumpers must declare on the appropriate form in the Show Office the day before the class is to be held by 5 pm. Late declarations will be subject to the Post Entry Penalty and may require the horse to work first in the order. Classes entered on the Entry Blank constitute a Declaration. Jumper Tables: Refer to the Time Schedule. Management reserves the right to change tables when entries warrant. Time Allowed: The Time Allowed will be based on a speed of 360 yards per minute for Pony Jumpers, and 382 yards per minute for all other sections unless otherwise noted, and may be adjusted accordingly. Martingales: 1.30m or below: No martingale restrictions when used in a conventional manner. Draw Reins permitted. Above 1.30m (and all classes restricted to young horses): Only running martingales used in the conventional manner. Note: Ponies may not be ridden by a Junior in draw reins or German martingales at any time. Ties: Ties involving first place will be jumped off. Ties not involving first place will be decided upon time unless otherwise stated. Secure Stabling: Grand Prix: The 24-hour stabling rule will be in effect for all Jumper classes offering prize money of $25,000 or more. Check-in for Grand Prix horses may require the horse to be presented to HITS staff 24 hours prior to each Grand Prix at a location to be determined. 2019 Zone 5 Specifications: (Check USHJA.org for the most updated specs.) • Children’s & Adult Amateur Jumper: To be ridden by Junior or Adult Amateur Riders. Low Children’s and Adult Jumper riders may not cross enter into any classes exceeding 1.15m. High Children’s and Adult Jumper riders may not cross enter into any High Junior or Amateur-Owner/Amateur classes or any other jumper class exceeding 1.30m. Fence heights to be set between 1.00m and 1.05m for Low and 1.10m and 1.15m for High. HITS ACCEPTS VISA, MASTERCARD & AMEX FOR PAYMENTS Credit Card transactions will be processed at Retail Prices. To use your Visa, MasterCard or American Express to pay for amounts due with entry(ies) such as horse deposit, stalls, RV’s, etc., please complete the form below and send with your entry(ies). PLEASE NOTE: This form must be filled out completely. All fields are required in order to process payment. Incomplete forms may cause entry(ies) to be considered late. Dover Saddlery Adult Medal and HITS Horse Shows Congratulations to all riders. Since hay is the first consideration when it comes to nutrition, skimping on quality could keep your horse from doing his best for you. Do your best for your horse. Feed Standlee Premium Western ForageÂ®. All natural. Always available. G E N E R A L I N F O R M AT I O N , R U L E S & R E G U L AT I O N S ● CONDITIONS OF COMPETITION ● Every class offered herein that is covered by the rules and specifications of the current USEF Rule Book will be conducted and judged in accordance therewith. Life, senior active and junior active members shall be eligible to participate in all classes at Regular Competitions, Eventing Competitions at the Preliminary Level or above and Combined Driving Competitions at the Advanced Level, Dressage, Reining and Vaulting Competitions and Endurance Rides. A nonmember may participate as a handler, rider, driver, owner, lessee, agent, coach or trainer at Regular Competitions, Eventing Competitions, Dressage Competitions, Reining Competitions and Combined Driving Competitions upon payment of a $45 nonmember registration fee. Participants in the following classes are exempted from the Requirements of this rule: 1) leadline; 2) exhibitions; 3) games and races; 4) classes for 4-H members; 5) walk trot and academy classes (academy classes are classes limited to horses used regularly in a lesson program); 6) USDF introductory level tests, pas de deux and quadrille classes; 7) NRHA Endorsed Reining Competitions, 8) Opportunity classes; 9) citizens of other nations who have proof, in English, of current membership in good standing of their own National Federation, 10) USEA beginner novice division; and 11) assistant handlers in Dressage Sport Horse Breeding classes. SERVICES: • Feed Store Hay, grain and bedding may be purchased on the grounds. For deliveries prior to or upon arrival, use the Feed Order form in the prize list or online. Place orders by noon for same day delivery. No deliveries on Sunday. Questions with regard to feed and bedding charges will not be considered after noon Friday. Discrepancies in deliveries will not be considered unless brought to the attention of the Feed Office within 24 hours of placing the order. No commercial feed or bedding source will be permitted to deliver on the show grounds. • Horse Watch Horses stabled on the grounds are required to pay a Horse Watch fee of $15 per show. Horse Watch extends from approximately 9 pm until 5 am daily. Horses will be checked approximately six times a night each night of the Show Week. Trainers/owners should provide emergency contact information for Horse Watch personnel. Forms will be available in the Feed Office or in the Prize List on Feed Order form. Cell phone numbers for Horse Watch will be available in the Feed Office for trainers/owners to be able to contact Horse Watch personnel directly. • Trainer’s Splits This service allows trainers to split the show charges for miscellaneous items to their clients. Splits will be accepted until close of business on Friday. Only items billed by the horse show such as feed, bedding, tack stalls, etc., will be split. Only dollar amounts will be split and totals will be rounded up. Splits will revert back to the trainer for payment if uncollected. • Exhibitor Check Cashing is no longer available. Please make arrangements with local banks. • Returned Checks or Credit Cards, for any reason, will be assessed a penalty of $50 or 10% of the face value of the check/credit card charge, whichever is greater. Upon notification, exhibitors will have three days to make full payment, including penalty, in certified funds, cashier’s check, money order, or credit card. An additional 3% Retail Adjustment will be added to all Credit Card transactions. Sanctioning organizations will be notified if exhibitors fail to pay in full within three days. A monthly service fee equal to 18% per annum will begin accruing after 30 days. Note: First time returned checks will automatically be redeposited. • Cash Only may be required if you have previously given a non-negotiable check to HITS. Contact our office. PRIZE MONEY: • Prize Money is issued to the “Recipient of Prize money” recorded on the entry form. A valid Social Security or Federal ID number must be provided. Checks will be withheld if proper information is not provided. Checks will be mailed or hand-delivered within 30 days after the Show. • Prize Money Won by Foreign Exhibitors is subject to the US Internal Revenue Service regulation requiring sporting events to withhold 30% of prize money. Foreign exhibitors should apply for a Social Security number and will be asked to complete Form W-8BEN prior to receiving Prize money. • Prize Money is awarded through 6th place in Hunter classes and through 8th place in Jumper classes. Prize money will not be distributed to classes with less than three entries ASSOCIATION MEMBERSHIP & FEE REQUIREMENTS: MEMBERSHIP - PEOPLE: • Owner-Rider-Trainer: Must be members of USEF and USHJA, or join at the show, or pay Show Pass fees. Foreign exhibitors must provide proof in writing (English) that they are a member in good standing of their national federation. • Adult or Amateur Status: Riders showing in classes restricted to Adults or Amateurs must have USEF Amateur Certification. Foreign Exhibitors must present documentation indicating their Amateur status with their home Federation and must join USEF and Sign for Amateur Status. Exception: Members of EC must sign for Amateur Status but need not join • Safe Sport: Beginning December 1, 2018, All Senior members of USEF will be required to complete a Background Check and Safe Sport training class at USEF.org before competing in a USEF Licensed competition. An exhibitor will not be allowed to compete until this requirement is met. MEMBERSHIP - FARMS & OTHER ENTITIES: Farms, Partnerships, and any entities owing a horse competing in a USEF Licensed Competition must be Recorded with USEF. The owner of the entity must be a member of USHJA or Pay Show Pass Fees. MEMBERSHIP - HORSES • USHJA Horse Registrations: All horses competing in USEF licensed Hunter/Jumper/Eq competitions must have or apply for a Registration # from USHJA. • USEF Horse Recording: Horses earning points toward USEF HOTY Awards and/or Zone Awards, USHJA Hunter Derby and Grand Prix must be Recorded with USEF Annually or for Life. • Microchip: Beginning December 1, 2018, all horses competing in USEF licensed Hunter/Jumper/Eq competitions must have a USEF-approved Microchip on file with USEF. Horses will not be allowed to compete until this requirement is met. • Measurement Card: Junior Hunters, Pony Hunters, Children’s Pony Hunters, and Pony Jumpers must have a valid USEF Measurement Card or copy of a valid Measurement Form, or be measured at the show. Foreign measurement cards are not acceptable as proof of measurement. MEMBERSHIP HORSE FEES: • Horse Fee: USEF $8, USHJA $7	• Horse Drug Fee: USEF $15 • High Performance Fees: Horses entered in Grand Prix are required to pay the $35 IHP Fee up to a total of the cap of $420 per competition year. Please refer to the USEF website for additional information. THE SHOW SECRETARY WILL NOT ISSUE A NUMBER TO ANY EXHIBITOR UNTIL ASSOCIATION REQUIREMENTS HAVE BEEN MET. ONCE THE NUMBER IS ISSUED, ASSOCIATION FEES, INCLUDING SHOW PASS FEES, WILL NOT BE ADJUSTED FOR THAT SHOW. Failure to provide proper credentials will result in show pass fees and/or Incomplete Entry fees charged in each incident. The Exhibitor has the ultimate responsibility for proper registration of horse, owner, rider and trainer with USEF / USHJA and for entering the horse under proper ownership where points are concerned. FACILITY INFORMATION • Footing is all-weather. • Food Service will be available every day. • Lungeing will be allowed in the designated areas only. • Ring Sizes may change from show week to show week and notice will be posted in the Show Office. The next generation of injectable joint supplements for high performance equine athletes is here! 2019 HITS Ocala and HITS Thermal Winter Circuits. OSPHOS® (clodronate injection) Bisphosphonate. For use in horses only. Brief Summary (For Full Prescribing Information, see package insert) CAUTION: Federal (USA) law restricts this drug to use by or on the order of a licensed veterinarian. DESCRIPTION: Clodronate disodium is a non-amino, chloro-containing bisphosphonate. Chemically, clodronate disodium is (dichloromethylene) diphosphonic acid disodium salt and is manufactured from the tetrahydrate form. INDICATION: For the control of clinical signs associated with navicular syndrome in horses. CONTRAINDICATIONS: Horses with hypersensitivity to clodronate disodium should not receive OSPHOS. WARNINGS: Do not use in horses intended for human consumption. HUMAN WARNINGS: Not for human use. Keep this and all drugs out of the reach of children. Consult a physician in case of accidental human exposure. As with all drugs, side effects may occur. In field studies and post-approval experience the most common side effects reported were signs of discomfort, nervousness, and colic. Other signs reported were: renal insufficiency/failure, anorexia, lethargy, hypercalcemia, behavioral disorders, hyperkalemia, hyperactivity, recumbency, hyperthermia, injection site reactions, muscle tremor, urticaria, hyperglycemia, and fracture. In some cases, death has been reported as an outcome of these adverse events. The safe use of OSPHOS has not been evaluated in horses less than 4 years of age or breeding horses. OSPHOS should not be used in pregnant or lactating mares, or mares intended for breeding. NSAIDS should not be used concurrently with OSPHOS. Concurrent use of NSAIDs with OSPHOS may increase the risk of renal toxicity and acute renal failure. Use of OSPHOS in patients with conditions affecting renal function or mineral or electrolyte homeostasis is not recommended. Refer to the prescribing information for complete details or visit www.dechra-us.com. CAUTION: Federal law restricts this drug to use by or on the order of licensed veterinarian. * Freedom of Information Summary, Original New Animal Drug Application, NADA 141-427, for OSPHOS. April 28, 2014. Dechra Veterinary Products US and the Dechra D logo are registered trademarks of Dechra Pharmaceuticals PLC. © 2019 Dechra Ltd.
PRECAUTIONS: As a class, bisphosphonates may be associated with gastrointestinal and renal toxicity. Sensitivity to drug associated adverse reactions varies with the individual patient. Renal and gastrointestinal adverse reactions may be associated with plasma concentrations of the drug. Bisphosphonates are excreted by the kidney; therefore, conditions causing renal impairment may increase plasma bisphosphonate concentrations resulting in an increased risk for adverse reactions. Concurrent administration of other potentially nephrotoxic drugs should be approached with caution and renal function should be monitored. Use of bisphosphonates in patients with conditions or diseases affecting renal function is not recommended. Administration of bisphosphonates has been associated with abdominal pain (colic), discomfort, and agitation in horses. Clinical signs usually occur shortly after drug administration and may be associated with alterations in intestinal motility. In horses treated with OSPHOS these clinical signs usually began within 2 hours of treatment. Horses should be monitored for at least 2 hours following administration of OSPHOS. Bisphosphonates affect plasma concentrations of some minerals and electrolytes such as calcium, magnesium and potassium, immediately post-treatment, with effects lasting up to several hours. Caution should be used when administering bisphosphonates to horses with conditions affecting mineral or electrolyte homeostasis (e.g. hyperkalemic periodic paralysis, hypocalcemia, etc.). The safe use of OSPHOS has not been evaluated in horses less than 4 years of age. The effect of bisphosphonates on the skeleton of growing horses has not been studied; however, bisphosphonates inhibit osteoclast activity which impacts bone turnover and may affect bone growth. Bisphosphonates should not be used in pregnant or lactating mares, or mares intended for breeding. The safe use of OSPHOS has not been evaluated in breeding horses or pregnant or lactating mares. Bisphosphonates are incorporated into the bone matrix, from where they are gradually released over periods of months to years. The extent of bisphosphonate incorporation into adult bone, and hence, the amount available for release back into the systemic circulation, is directly related to the total dose and duration of bisphosphonate use. Bisphosphonates have been shown to cause fetal developmental abnormalities in laboratory animals. The uptake of bisphosphonates into fetal bone may be greater than into maternal bone creating a possible risk for skeletal or other abnormalities in the fetus. Many drugs, including bisphosphonates, may be excreted in milk and may be absorbed by nursing animals. Increased bone fragility has been observed in animals treated with bisphosphonates at high doses or for long periods of time. Bisphosphonates inhibit bone resorption and decrease bone turnover which may lead to an inability to repair micro damage within the bone. In humans, atypical femur fractures have been reported in patients on long term bisphosphonate therapy; however, a causal relationship has not been established. ADVERSE REACTIONS: The most common adverse reactions reported in the field study were clinical signs of discomfort or nervousness, colic and/or pawing. Other signs reported were lip licking, yawning, head shaking, injection site swelling, and hives/pruritus. Cool styles, awesome prices, exceptional qualityâ&#x20AC;Ś this is Horze. As an international provider of solutions for equestrian apparel and tack, Horze is proud to be your source for helpful and interesting products. By collecting feedback and continually improving our selection, we combine innovative technology and the latest trends and fashions to stay ahead of the competition. Whether you are a beginner just learning the basics in pony club, or a Grand Prix level rider with hundreds of hours in the show ring, Horze offers products that are stylish, dependable and guaranteed to deliver results. Meet our first Equine Ambassador! Owned by Cheryl Olsten & Ridden by Amanda Steege EQUUS Foundation Equine Ambassadors are sport horses whose owners donate a portion of their winnings in equestrian sport competitions to support the mission of the EQUUS Foundation. Most horses will have multiple homes during the lifetimes, but thousands of horses suffer from abuse, neglect and being shipped off to slaughter each year. Help safeguard the comfort and dignity of all of America’s horses and provide opportunities for horses to share their magic with as many people as possible - especially people with special needs. There’s no greater gift you can give than to have your equine partner pay it forward! Join us for the love of horses! Where America’s Horses Go Next is Up to All of Us! www.equusfoundation.org/ambassadors The EQUUS Foundation (Tax ID #45-1547242) is the only national charitable foundation in the United States 100% dedicated to protecting America’s horses and strengthening the bond between horses and people. Contact us at 203-259-1550 or mail@equusfoundation.org. Apply today for a 2019 Regional Training Session near you! Operated in accordance with the current rules of the USEF of which body they are Regular Members and are Rated National in: High Performance Hunter - Performance Hunter 3’6” - Performance Hunter 3’3” High Performance Conformation Hunter - Green Hunter - Green Conformation Hunter - Young Hunter - A-O Working Hunter - A-O Working Hunter 3’3” - Junior Hunter - Junior Hunter 3’3” - Pony Hunter - Green Pony Hunter. Rated Regional II in: Children’s Hunter - Adult Amateur Hunter - Thoroughbred Hunter 2. USEF SAFE SPORT TRAINING REQUIRMENT Starting January 1, 2019, if you are a USEF Competing Member 18 years of age or older you are required to complete the core Safe Sport Training within 30 days of activating your membership. If you do not complete the training, you are ineligible to participate in all USEF activities including competitions. TAKE the SAFE SPORT TRAINING at USEF.org by logging into your member dashboard.